On a more practical note, adding beans makes it about $3 cheaper per batch (depending on ground beef prices in your area.) That amount adds up over a few meals. And if you want a version that has no beans, this is easily adapted. Simply add an extra pound of ground beef plus a cup of water in place of the dried beans. This also makes it Keto Texas Chili. Beans: You have several great options: small red beans, black beans, pinto beans, or kidney beans. I usually base that decision on what I have in my pantry at the time, but the small red ones are my favorite for chili. This should fill the 6 qt Instant Pot to its pressure cooking capacity of 2/3 full or 4 quarts. Make sure you don’t go over that line! Turn Instant Pot on <Sauté>. Ensure your sauté setting is not on <high>. This will help keep the beef from sticking to the bottom, which could keep your IP from coming to pressure. Brown ground beef with onions and bell peppers. Add first can of tomatoes to deglaze any remaining browning on bottom of pot. Add remaining ingredients. Stir well. Close lid. Check valve to make sure it is set on <Sealing>. Set Instant Pot to <Bean/Chili> program and adjust the time to 25 to 35 minutes at <High> pressure (25 for small beans like red beans, 30 minutes for medium beans like pintos, 35 minutes for large beans like kidneys). When pressure cooking time is finished, allow pressure cooker to Natural Release (NR) for at least 15 minutes. Then Quick Release remaining pressure. Set Instant Pot to <Bean/Chili> program and adjust the time to 9 minutes at <High> pressure. When pressure cooking time is finished, allow pressure cooker to Natural Release (NR) for at least 5 minutes. Then Quick Release remaining pressure. Brown ground beef, onions, and bell peppers. Add garlic, cumin, chili powder, and oregano and stir well for one minute. Mix in beans (cooked, drained, and rinsed). Stir in tomatoes and 2 cups of water. Add brown sugar, salt, and worchestershire sauce. Simmer on stove top for at least 20 minutes, but it’s better the longer it simmers. Transfer this mixture to Slow Cooker insert. Add brown sugar, salt, worchestershire sauce, beans and tomatoes. Stir to combine. With a slow-cooker, you likely will want to soak your beans overnight. Set on High for 4-6 hours or Low for 8-10 hours. One of the best things about this fabulous, nutritious comfort food is there are so many different ways to serve it! 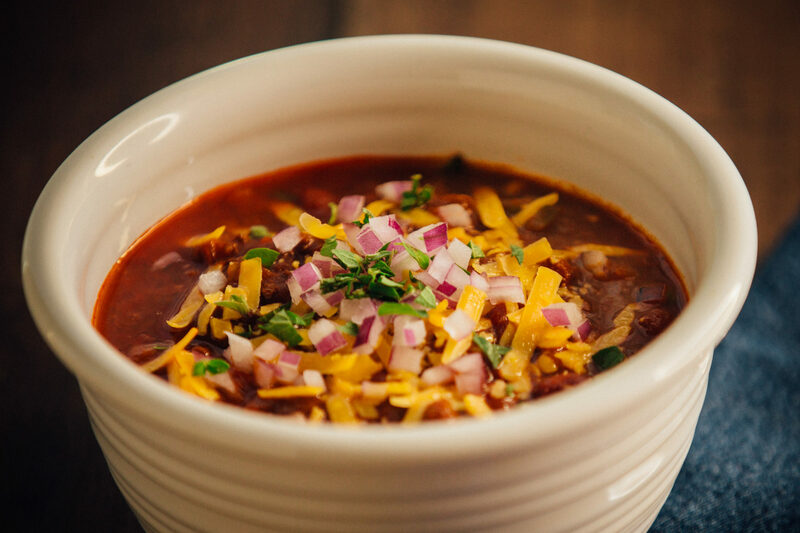 Traditional Chili: Serve as a soup, with saltine crackers and cheddar cheese. Chili Over Rice: Serve chili over rice with sour cream, shredded cheese, and green onions. Frito Pie: Place Fritos in a bowl. Ladle Chili over Fritos. Top with Sour Cream and shredded cheddar cheese..
Cincinnati Chili 5-way: Serve chili over cooked spaghetti, with diced onions, and shredded cheddar cheese. Chili Baked Potato: Serve over a baked potato with sour cream, shredded cheddar cheese, and sliced green onions. Quinoa Superfood Chili: Stir in some cooked quinoa and cubed, cooked sweet potato. In a small college town in Kentucky in 1998, a legendary storm dropped several feet of snow on the ground. This closed down the college for 3 days and provided lots of free time for me and my future husband. We hadn’t started “officially” dating yet, but we really wanted to, we just hadn’t told each other yet. 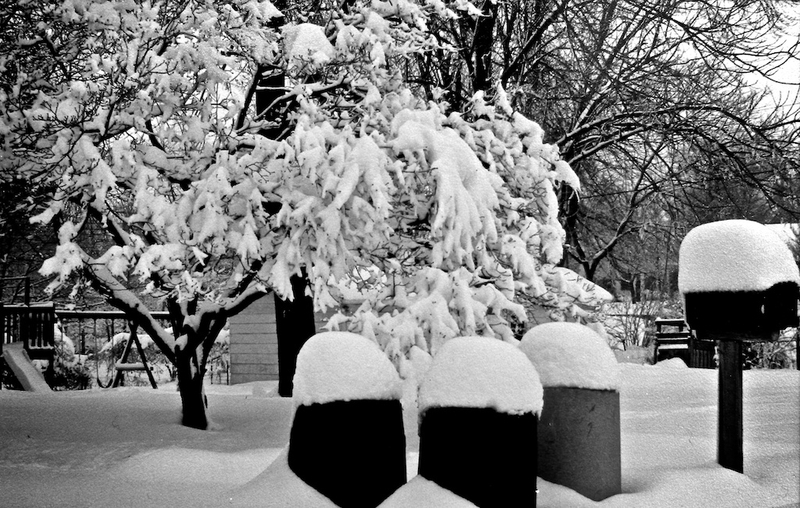 We spent those snow days together, playing in the snow and taking photos of the beautiful winter scenes (with a film camera!). On a whim, we decided to make a pot of homemade chili from scratch, the way we made it growing up on my Indiana farm. We walked together to the local grocery and gathered the ingredients. As we got to the register, we pooled our resources to pay. Between the two of us, and I am not making this up, we had the exact amount needed to buy the ingredients. That was a magnificent pot of chili. It led to marrying the love of my life, and there are 7 kids who are pretty happy we cooked chili that day also. 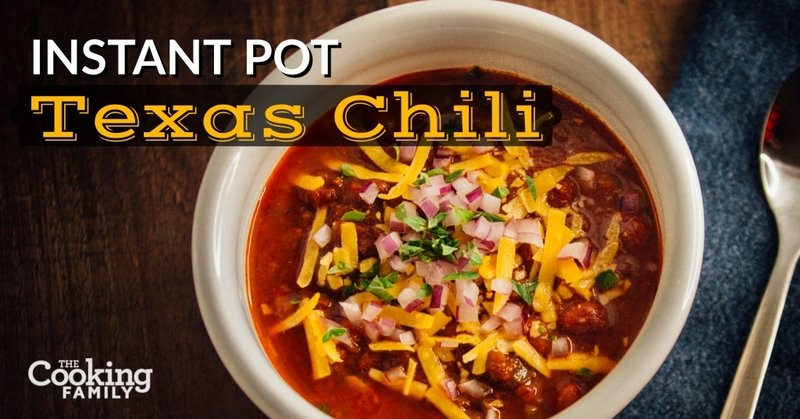 We hope you love this chili recipe as much as we do. We’ve been perfecting it for 20 years. And if you’re single, we can’t guarantee you’ll find a spouse with it, but it can’t hurt to try! 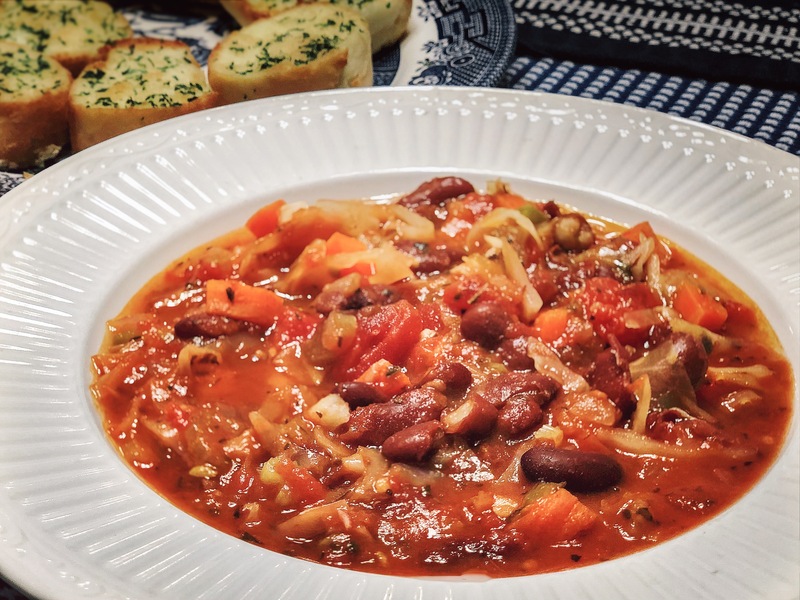 A hearty recipe that makes a delicious meal, with beans or without! Turn Instant Pot on <Saute>. Ensure your sauté setting is on <Medium> or <Low>. This will help keep the beef from sticking to the bottom, which could keep your IP from coming to pressure. Add first can of tomatoes and stir, scraping the bottom of the pot to deglaze any remaining browning on bottom of pot. Turn Instant Pot on <Sauté>. Add beans and tomatoes. Stir to combine. With a slow-cooker, you likely will want to soak your beans overnight. This chili was a huge success in my household. I made the all meat, no beans version. Utilized 2 1/2 tablespoons of cumin instead of the recommended 4. I also added a tablespoon of cocoa powder. Chili was just to our liking. Made so much chili we froze the leftovers for another day! Thank you!! Thank you for making our chili and reporting your results, Jennifer from Texas! Sounds really delicious, I’ll have to give the cocoa powder a try. Do you find it adds a bit of richness to it? Have you always added cocoa powder? This looks delicious and I loved watching your beautiful family cook together. I am in Texas also, and have two teenagers. There’s only four of us and eight of you – I am surprised that 1 pound of meat is enough to feed the whole family! Good catch! I would add those ingredients with the beans and tomatoes in Step 4. And I’ll update the recipe. Thanks for the heads up! Oh awesome, thank you! I think the stove top one was missing that are too. I don’t think it will hurt anything to do it that way. Hope it turns out great! Happy New Year! This is my first time on your website, drawn here by a Facebook post from Amy. I’m so inspired that I’m going out to buy an IP!! Can’t wait to try the chili and your other recipes!